Fresh baked lemon scented scones studded with cranberries, topped with a lemon glaze; a perfect Sunday morning treat. I’m a scone lover and enjoy playing around with different varieties. Lemon scones have been on my to-do list for quite some time, the added dried fruit was a last minute addition that turned out wonderful. For perfect scones, be careful not to over-knead the dough and be sure your butter is chilled. Leftovers can be stored in air-tight containers for up to two days. I’ve tried these using all whole wheat flour but I prefer to use a blend of whole wheat and white. Enjoy! Position rack in top third of oven; Preheat oven to 375°. Make glaze by combining 2 tbsp sugar and 1 tbsp lemon juice. Combine buttermilk, remaining lemon juice, sugar, lemon zest, vanilla, and egg in a medium bowl, stirring with a whisk. Gently fold in cranberries or cherries. Form dough into an 8-inch circle onto baking sheet, about 3/4″ thick. Using a knife, cut dough into 10 wedges (do not cut all the way through). Brush lemon glaze over dough. Bake until golden, about 18-20 minutes, or until a tester comes out clean. If you leave out the dried fruit, the scones are 4 points plus each. could i substitute 1 for 1 gluten free flour instead of what’s called for? Hi. What would happen if I made these with regular milk instead of buttermilk and added poppy seeds to the recipe? Gina? Anyone? I mixed the dry ingredients together and the wet ingredients together the night before and substituted orange for the lemon. They were simply awesome! I can't wait to make again!! These are delicious! I love nuts so I added about 1/4 cup of chopped walnuts to the recipe. Yum! I love these! I used regular skim milk instead of buttermilk and changed the lemon to orange. So delicious! We loved this. Made it exactly as it was written. My four-year-old really thought it was, "AWESOME!". Thanks for your wonderful recipes. I use them all the time for my family. Thanks for this web site. It's really helped me lose some poundage! I made these today using chocolate chunks inteas of dried fruit. They came out a little underdone and gummy inside, do you think the chocolate made the dough too heavy? Or maybe it's because I used half brown sugar, half white? I want to make them again, and better, because they still tasted delicious! I know you have a separate recipe for choc. chip scones, but I love the tangy flavour of lemon + chocolate is a must! Gina, I have been meaning to make this recipe for some time now and finally got around to it today. It smelled so good coming out of the oven that I could not wait to try them. They taste as good as they smell. Thanks for this and all your wonderful recipes. I've tried a lot of them by now and they are all great. Love all your recipes! 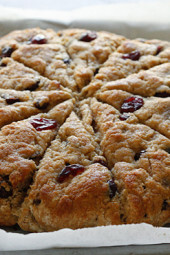 I am going to make this an orange cranberry scone necauae those are my fav and i am out of lemon. Hey these look great =] I actually have a box of King Aurthur scone mix in my pantry that i need to use up first, but do you think that I could use the same butter, milk and egg ratio that you did? First I'd like to tell you that I love your sight and make your recipes all the time. You're awesome! Do you think that I can drop these by large spoonfuls like your blueberry scones? I would assume so, butbd hate to mess these up. In case you haven't found the answer to your post, of Mar 20, this is as close an answer as I could come up with. Probably not exact but close enough I think. Just got them out of the oven! Great recipe! This was a delicious recipe! I mixed tangerine juice and zest with the lemon juice & zest for a blended citrus flavor – turned out very nummy! I've been trying to make scones for several years – they never turn out…until I tried your recipe! Thank you for a great (and easy) recipe! Just made these using orange instead of lemon….they are so good! I made an extra batch to freeze too. Merry Christmas! I've never tried that Brinda, not sure. Can these be mixed up and placed in the refrigerator to be baked the next morning? Found this site earlier this year and absolutely LOVE it! I tried this scone recipe and substituted coconut oil for the butter and it was delicious! I make biscuits all the time and never tried scones. I also used fresh cranberries because that's what I had. I upped the sugar to 1/3 cup and it was perfect. I recently had a cinnamon scone. How can I alter this recipe to make just a cinnamon scone? Thanks! These were very good. I was initially concerned about the sweetness and thought about adding more than 1/4 cup of sugar, but you don't need it. The cranberries make this sweet. The other positive is that these come together pretty quickly! I've been wanting to make these for the longest time but for some reason the word "scone" freaked me out. Finally made them tonight and I can't wait to share them; they turned out so delicious! Thanks for another fantastic recipe Gina! Wonderful!!! This was my first attempt at making scones and I don't think I did half bad-lol!! has anyone tried this using splenda? would that work too? Thanks Michelle! It's great to get a thumbs up from the UK!! Made these for Easter morning breakfast. Followed the recipe exactly and they were PERFECT!!!! Delish!!! Enjoyed them right out of the oven with a cup of coffee, but were equally as good when cooled! Lived in the UK for a bit and picky about a good scone and THESE are a GOOD scone! LOVE IT! Try these if you are considering it!!!!!! I made these this weekend, but I used raisins and oranges instead (it was what I had on hand). They turned out amazingly good! It was a great Sunday breakfast. I've never made scones before, these worked out so well! Made the house smell yummy too! Great job, keep em coming. Anyone who changes this recipe would have to use recipe builder to see the new points. What would the points be if I used Splenda, and egg substitute? first time here and would love to revisit. i am booking mariking ur blog. 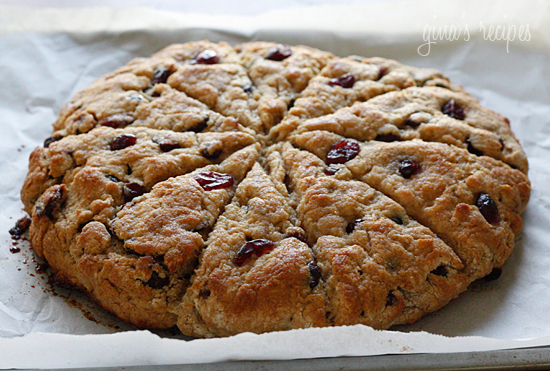 I used this recipe but made Cherry Almond Scones. These were amazing!!! I omitted the lemon juice and subsituted almond extract for the vanilla and dried cherries for the cranberries! Yummm! Carrie, I dont think it would be weird. Ashley, I bet you could use lactaid milk instead! Is there a good non-dairy substitute for buttermilk? I would really like to try these, but I am lactose intolerant. I've made them twice already!! I totally dig your blog. Look, I even made your recipe and put it on mine! I was thinking of making these and also adding in a few frozen blueberries and using ocean spray cranraisins for the cranberries. Is that a weird combo you think? Carolyn, love the addition of poppy! The dried fruit really sweetens these so if you leave the fruit out, they may need more sugar. Emma, thanks for sharing! Can't way to try your grandma's version!! They are light slightly lower in points (3pp) and have a much lighter consistency than scones with egg/ buttermilk. The flecks of butter help the scone to rise and be flaky and light. Thanks for another great recipe, Gina! I made these tonight and left out the fruit in favor of poppy seeds (1 Tablespoon). Like a previous commenter said, the scones were very moist, which is fantastic! 1) Mine didn't turn out as "lemon-y" as I wanted, and I doubled the lemon juice. I might add a little lemon extract next time. 2) I know it's not traditional, but I do like my scones a little sweeter. I might experiment with a Splenda-lemon juice glaze to drizzle over the top after baking, or even add some Splenda to the recipe. Meg, I'm not really sure, you'll have to plug it into recipe builder. Aidensmom- These would be wonderful with orange in place of lemon. Looks delish! I wonder how it would taste with orange instead of lemon? I love orange and cranberry together. Thanks for all you do Gina!!! Wow, these look and sound SO good! These sound like just the thing to make today for the weekday mornings on the fly! Oh yum! I love citrus and cranberry! I'm gonna try substuting orange for the lemon because orange cranberry scones are my favorite! Do you think these would freeze well? This looks so good. I plan on adding it to my Easter brunch menu. I just love your blog and recipes. I've made several of them – and they were all great. Thanks!!! Your recipe looks delicious! I am anxious to try it! I've had scones at some restaurants/bakeries and they always seem dry. I ran across this recipe years ago from a Food Network Show. While it uses more butter than your recipe does, it has oatmeal in it which seems to give a softer result. These too are wonderful! Could you please analyze this recipe and see what you think could be done to bring down the fat/calorie count. Thank you! The rest of the directions are the same as for yours, except for cutting into individual pieces and then baking at 375 for about 22 minutes. Just made these with fresh blueberries instead of cranberries. Had a slight bitter taste – probably from the wheat flour – but still good (and not dry like many scone recipes). If using fresh fruit, fold the fruit as final step instead of before adding liquid. As a fellow food-blogger and food photographer, these are gorgeous!! oops, meant to say "love" not "look"
That looks so good, I'd look a slice with a hot cup of tea. I love scones too! I can't wait to make these with raspberries like another poster said! These look beautiful! I am in charge of the food for a competition my dog club is putting on the end of April. I am going to be making these plus several other recipes from your site. In the past, the food at these events has always been notoriously unhealthy. Thanks to finding your blog, I'm going to change things up for the better!! I made these tonight and they are delicious!!! Perfect amount of lemon and the glaze makes the scone! Love this recipe! Next time I am going to try them with frozen raspberries. Thanks Gina! Gwen, I think they would be ok, I've made them with blueberries and strawberries and both were wonderful. Dyan, Thanks, I'm happy you think so! Amy, have you tried my banana pancakes? They are heavenly, taste like banana bread! Sounds delicious! We tend to go toward pancakes and french toast on the weekend, but I want to try these scones and see how they go over. I think my guys will love 'em! Hi, Gina – I haven't tried these yet, but just spent a good part of my Sat afternoon going through your entire blog. You have some amazing recipes, and I love that you have photos with everything. I've recently got back on a cooking kick and now have bunches and bunches to try. Thanks so much for all the time and effort you put into this. These sound amazing! Do you think it would work with fresh berries, or would the dough be too wet? Cranberries would probably be too tart but I have frozen blackberries from my CSA that are begging for some special treatment.